I celebrated Navratras in Chandigarh after a very long time and participated in a long standing Navratra Tradition of our family-of Worshipping `Sanjhi`. Punjab has a traditional way of celebrating Maa Durgas` visit on earth. In almost all Punjabi households, a ‘Sanjhi’ or Mother Goddess is created out of cowdung and mud and then plastered on the wall. 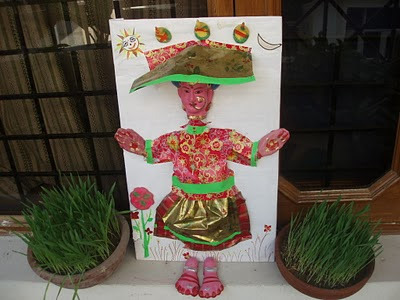 My grandmother used to make Sanjhi by moulding cow dung in the shape of figures and then painting the face to give it a life like look.My aunt has kept the tradition alive but the only difference is that she uses only mud and instead of plastering the Sanjhi on the wall she uses a huge piece of cardboard. In the Sanjhi you see above, she has created the faces, hand and feet and the flowers out of mud and then painted them. 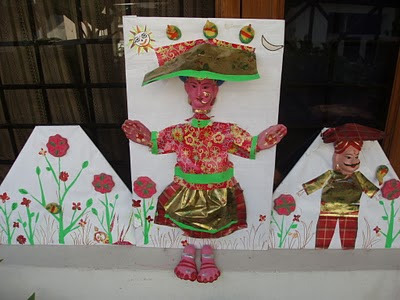 She has used paper for the dresses! The two flower pots with the green leaves is another tradition followed during Navratras. On the first day of Navratras, seeds (usually Barley) are sown and then watered every day. This signifies prosperity and good luck. Almost every festival in Punjab is linked to farming. Usually the farmers start sowing seeds for wheat and other pulses after Dusshera and sowing of these barley seeds is actually a prayer to the Goddess for a good crop. It is believed that Maa Durga comes down to earth to visit her parents during Navratras and returns on Dusshera. Usually the sanjhi is taken off the wall and immersed in a river on that day. (Similar to Durga Pooja). The barley has grown a few inches by then and is plucked and given to brothers by sisters. This signifies continuous prosperity and happiness in the family. Wow! I'm speechless at the artistic presentation! I wonder how each state in India has their own different traditions! This custom and story is new to me. Glad to know them!! Hope you had a fun-filled Navarathra!! @vaish - Thank You.My aunt is really good at such things ! It is amazing! also inspiring how she has kept the tradition alive. Thank you for sharing. Hey Ruchira! Didnt know sanjhi was celebrated in Punjab too, I remember witnessing it in my village near Baghpat, UP. Though not this detailed or fancy! This one looks like a star! Thanks for sharing! Very interesting, Ruchira! Like I said, I remember mom fasting and cooking yummy goodies for us. And remember watching Ramleelas on TV. In my own home, it is life as usual. In the South, they do an arrangement of dolls on a stepwise structure. These dolls could depict a story or be just a display. It is interesting to see them in the houses that I am invited to and to understand the cultural diversity across our country. I don't fast nor do I do anything different in these 9 days except play dandiya that is organized in our community :). This is the first time I'm reading about how Punjab celebrates Navratri and I realized how little I know about our country. interesting..i never knew about this tradition and way punjab celebrated navratras! !